21 Balancoires (21 Swings) is an urban scale collective instrument, a game where together we achieve better things than separately. The installation consists of a series of 21 musical swings. When in motion, each swing triggers different notes. When used all together, the swings compose a musical piece in which certain melodies emerge only through cooperation. It’s a game where, from the start, you need to adjust to the actions of others. The notes that are played are determined by how high a person swings. The color of the swing indicates the instrument it plays: piano, harp, guitar, vibraphone. The instruments are distributed differently within each set of three swings to create different musical configurations. When multiple swings move in synchronicity, a mini scale is played, revealing more notes and melodies. When all swings are in use, a secret musical mode is activated to give a special reward to players a synthesizer sound plays on all swings and transforms the experience. The result is a giant collective instrument that stimulates ownership of the space, bringing together people of all ages and backgrounds, and creating a place for playing and exchanging in the middle of the city center. In Montreal’s entertainment district, the Promenade des Artistes (the Artists’ Promenade), a narrow 170m long piece of land had been closed for several years, separating two worlds a major music venue complex and a renowned science faculty. Our objective was to foster new visit rituals to this abandoned piece of land. We wanted to create a playful interaction that would function day and night, cater to local audiences, both art and science worlds, as well as to the general public. The music complex inspired us to open up the magic of making music to those who pass by the promenade, and we worked with scientists to ensure the project’s relevance to a scientific community. Together with Luc-Alain Giraldeau, an animal behavior specialist from Universite du Quebec Montreal, we developed this collective musical instrument that stimulates and rewards cooperative behaviors. Cooperation does not come from an individual’s decision. Instead, it emerges from a particular social interaction where the behavior of each individual depends on the decisions of the rest of the group: it’s a game where, from the start, you need to adjust to the actions of others. 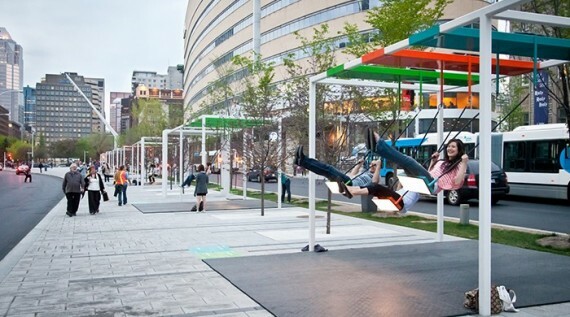 The swings were quickly adopted by Montrealers and transformed a transit space into a public place. This instinctive way of creating music using one’s entire body stimulates people to play, to experiment and leads people to become aware of each other’s experience, to converse and exchange. Old people, young people, couples, punks, skateboarders all played on the swings. Families from all over the city took over a set of swings for a long time, sometimes having a picnic. Strangers engaged in conversation around the swings. Passing drivers stopped and got out to see the swings. Everyone who passed stopped and smiled for at least a moment. A video of the 21 Swings project went viral on the Internet in September 2012 receiving over 246,000 views and was covered in numerous international publications. Viewers from all over the world were moved by the inventive, playful nature of the installation and how it transforms the urban environment. The swings have become Montreal’s favourite springtime ritual, part of the city’s DNA and are slated to reappear every year. But most importantly, the project gives people a sense of ownership of the public space they are everyone’s swings. The swings interface was chosen because people are naturally attracted to them and immediately know what to do. Swings create a sense of nostalgia, throwing people back to their childhood. And the choreography of a line of colorful swings in constant motion, lit from underneath at night is eye catching from afar and creates a powerful invitation. We worked with a composer to make an interactive piece that would enable anyone playing with the swings to make beautiful music. We found it particularly interesting to marry very familiar sounds, recordings of real instruments, with this high-tech installation. The sound quality was also chosen to fit harmoniously with the ambient noise of the urban environment, and the volume adjusts according to the time of day. Each swing has a sensor inside that networks its position in real time to a central computer over a fiber optic data link. Custom software runs the system and allows for continuous monitoring of the installation. All the wiring, sensors and speakers are concealed from the public in order to maintain the dreaminess of the experience.